Long-term strategic donor the Australian Centre for International Agricultural Research recently renewed its commitment to the mission and research of WorldVeg. Australian visitors in South Asia. Farmers are forming groups, learning how to grow, harvest and deliver quality produce for high-value markets, and finding new markets to tap through the VINESA project. When people in Tanzania began producing vegetables for market sale through the VINESA project, many decided to include them in their own meals. Local diets are now more diverse and nutritious. Growing and cooking vegetables with VINESA! Join the students at Emmanuel Primary School in Tanzania on a tasty journey to add diversity and nutrition to their diets with vegetables. 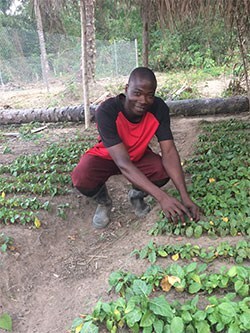 Through his work with the VINESA project, Joshua Elisa Palangyo, a young farmer in Tanzania, produces beautiful sweet peppers -- and the pepper seed, so other farmers can join in his success. A young farmer in Tanzania participating in the VINESA project talks about his experiences with contract farming for vegetables.